If your motorcycle won’t start or isn’t running well, it could be do to lack of compression. A compression test is easy to perform and can help diagnose what’s going on inside your top end. Generally speaking, a motorcycle with around 100 PSI compression in its cylinders will likely need a rebuild very soon. 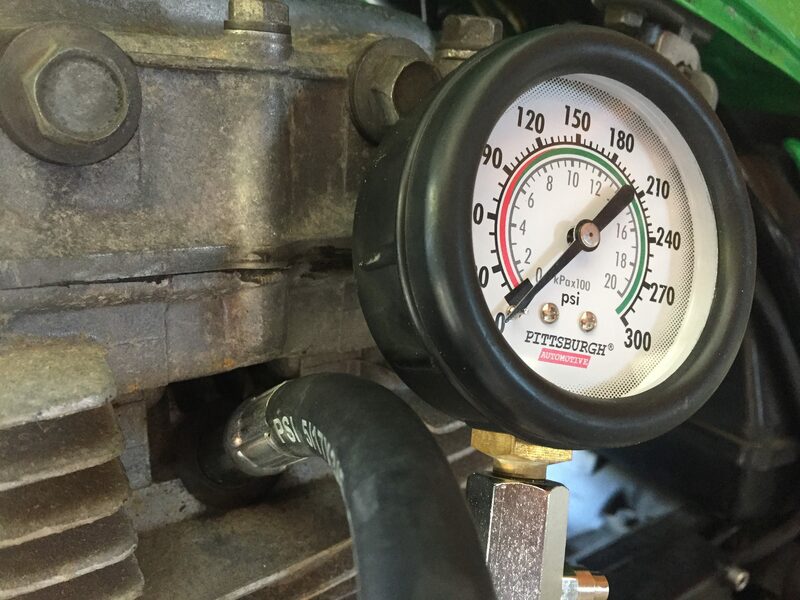 Compression gauges work by either screwing into or pressing into your spark plug holes with a hose attached to a pressure gauge. The side of the gauge usually has a pressure release button. If you don’t have a compression gauge, you can run a poor-man’s compression test by holding your thumb on top of the spark plug hole. If your able to keep your thumb on the hole while you turn the engine over, your engine has low compression. Turn off the ignition or ground the spark plugs. Insert the pressure gauge hose fitting into the spark plug hole of the cylinder you want to test first. Kick the kick starter or turn the engine over with the electric starter a few times. Record the pressure reading, release the pressure in the gauge, and repeat until you get consistent results for the cylinder. Move on to the next cylinder. A warmed up engine will give you a more accurate reading, but you can run a compression test on a cold engine. A good test will result in decent compression/PSI. Your shop manual should specify the exact readings for your bike. Additionally, you’ll want all of the cylinders to be within about 10 PSI of one another. Drop some engine oil down the spark plug hole. Attach your compression tester gauge and run the test again. If the readings come back higher than the original compression test, the low compression is likely due to the rings. If the readings don’t change, it’s likely due to your motorcycle’s valves. If your valve clearance is too tight and not set properly, it could be causing the low readings. Check and set your valve clearances as per the motorcycle shop manual. Run the compression test again.